5-6-03: Final course grades are available through the Grades web page! 3-24-03: Project #5 has been posted to the Projects web page. 3-17-03: Project #4 has been posted to the Projects web page. 3-4-03: The answer key to the midterm exam is available on the Tests web page. 2-20-03: The midterm exam is March 4. 2-8-03: Project #3 has been posted to the Projects web page. This project is due by the beginning of class on Tuesday, February 25. 1-19-03: Project #2 has been posted to the Projects web page. This project is due by 2PM on Friday, February 7. 12-30-02: Welcome to the STAT 4091 website! Look for important class announcements here throughout the semester. 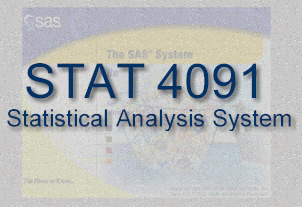 12-30-02: Statistics graduate students should sign up for the "STAT 5910-351" version of the course. Both 4091 and 5910 are the same courses and meet at the same time. This website was last updated on 05/06/03 and is best viewed in Internet Explorer 5.0 or higher.